 MSRP $22,845. 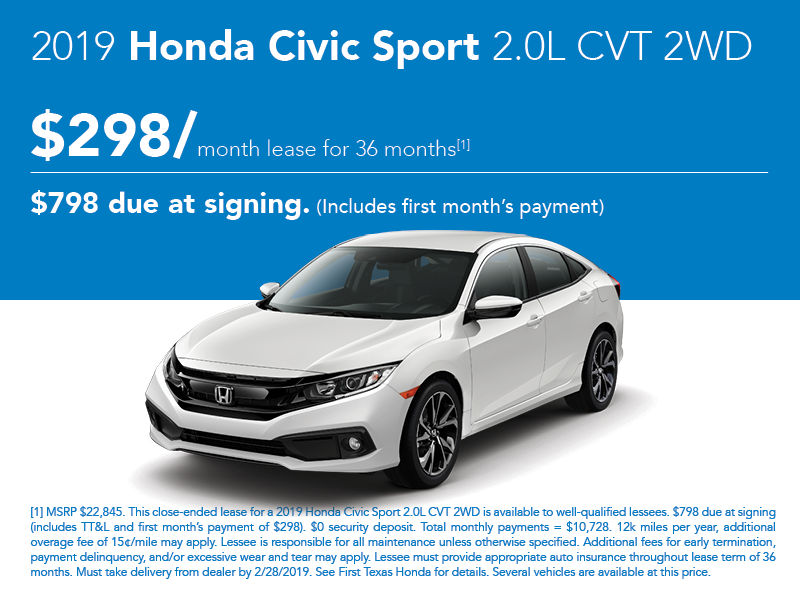 This close-ended lease for a 2019 Honda Civic Sport 2.0L CVT 2WD is available to well-qualified lessees. $798 due at signing (includes TT&L and first month’s payment of $298). $0 security deposit. Total monthly payments = $10,728. 12k miles per year, additional overage fee of 15¢/mile may apply. Lessee is responsible for all maintenance unless otherwise specified. Additional fees for early termination, payment delinquency, and/or excessive wear and tear may apply. Lessee must provide appropriate auto insurance throughout lease term of 36 months. Must take delivery from dealer by 2/28/2019. See First Texas Honda for details. Several vehicles are available at this price. MSRP $23,215. 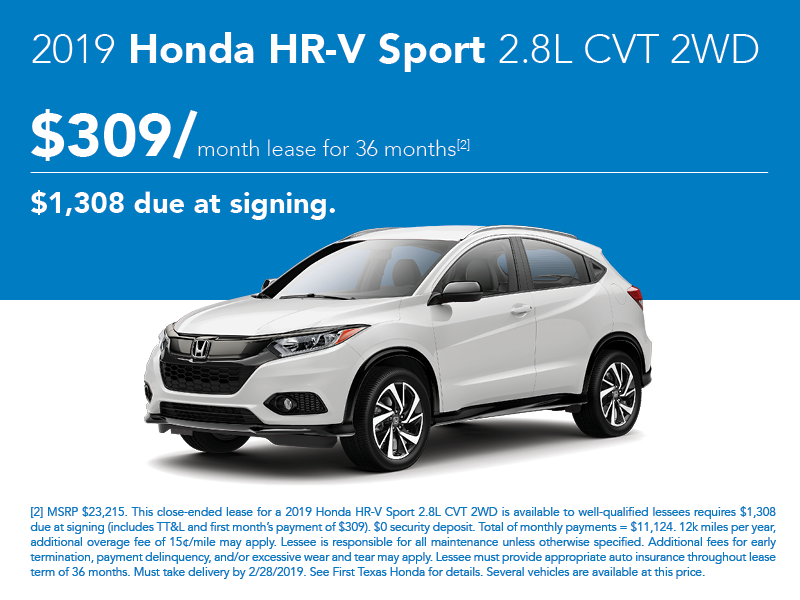 This close-ended lease for a 2019 Honda HR-V Sport 2.8L CVT 2WD is available to well-qualified lessees requires $1,308 due at signing (includes TT&L and first month’s payment of $309). $0 security deposit. Total of monthly payments = $11,124. 12k miles per year, additional overage fee of 15¢/mile may apply. Lessee is responsible for all maintenance unless otherwise specified. Additional fees for early termination, payment delinquency, and/or excessive wear and tear may apply. Lessee must provide appropriate auto insurance throughout lease term of 36 months. Must take delivery by 2/28/2019. See First Texas Honda for details. Several vehicles are available at this price. MSRP $24,465. 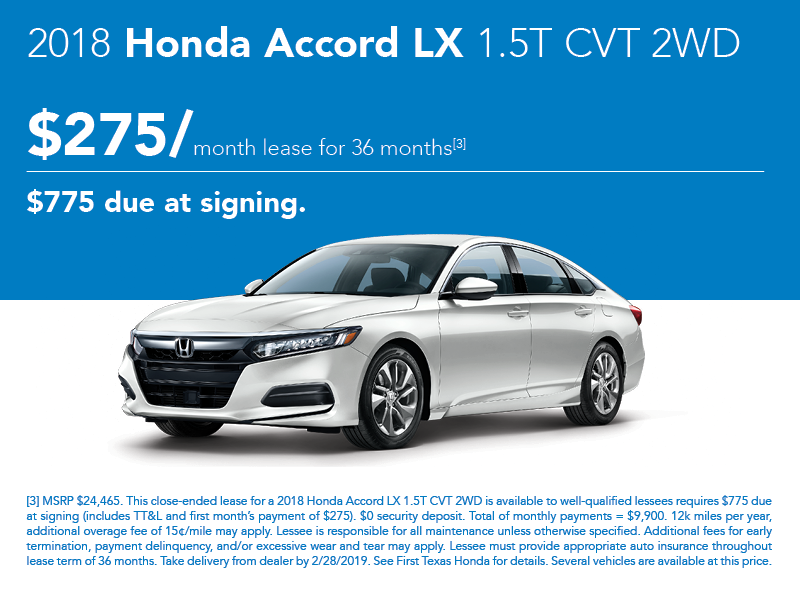 This close-ended lease for a 2018 Honda Accord LX 1.5T CVT 2WD is available to well-qualified lessees requires $775 due at signing (includes TT&L and first month’s payment of $275). $0 security deposit. Total of monthly payments = $9,900. 12k miles per year, additional overage fee of 15¢/mile may apply. Lessee is responsible for all maintenance unless otherwise specified. Additional fees for early termination, payment delinquency, and/or excessive wear and tear may apply. Lessee must provide appropriate auto insurance throughout lease term of 36 months. Take delivery from dealer by 2/28/2019. See First Texas Honda for details. Several vehicles are available at this price. MSRP $38,605. 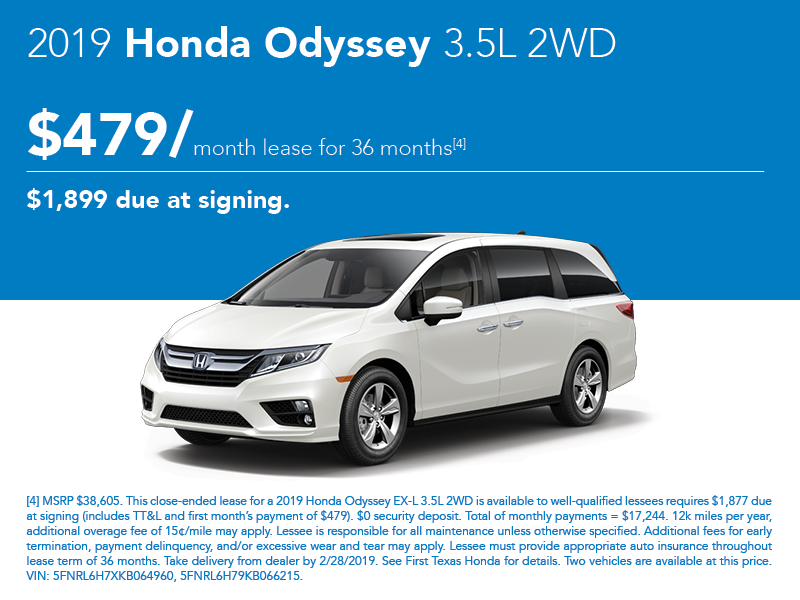 This close-ended lease for a 2019 Honda Odyssey EX-L 3.5L 2WD is available to well-qualified lessees requires $1,877 due at signing (includes TT&L and first month’s payment of $479). $0 security deposit. Total of monthly payments = $17,244. 12k miles per year, additional overage fee of 15¢/mile may apply. Lessee is responsible for all maintenance unless otherwise specified. Additional fees for early termination, payment delinquency, and/or excessive wear and tear may apply. Lessee must provide appropriate auto insurance throughout lease term of 36 months. Take delivery from dealer by 2/28/2019. See First Texas Honda for details. Two vehicles are available at this price. VIN: 5FNRL6H7XKB064960, 5FNRL6H79KB066215. MSRP $40,665. 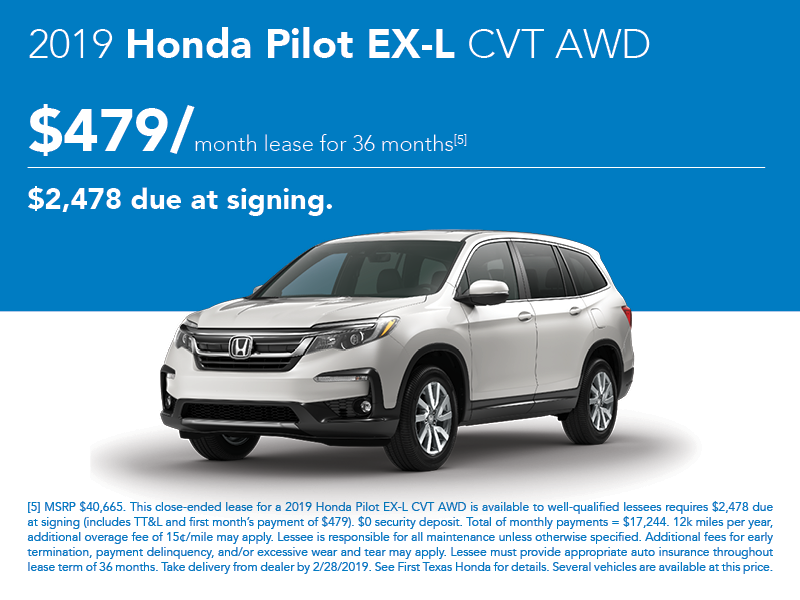 This close-ended lease for a 2019 Honda Pilot EX-L CVT AWD is available to well-qualified lessees requires $2,478 due at signing (includes TT&L and first month’s payment of $479). $0 security deposit. Total of monthly payments = $17,244. 12k miles per year, additional overage fee of 15¢/mile may apply. Lessee is responsible for all maintenance unless otherwise specified. Additional fees for early termination, payment delinquency, and/or excessive wear and tear may apply. Lessee must provide appropriate auto insurance throughout lease term of 36 months. Take delivery from dealer by 2/28/2019. See First Texas Honda for details. Several vehicles are available at this price.